6 ¶ Now there was a day, when the sons of God came to present themselues before the Lord, and Satan came also among them. 9 Then Satan answered þe Lord, and sayd, Doeth Iob feare God for nought? This book is so called from Job, whose prosperity, afflictions, and restoration, are here recorded. He lived soon after Abraham, or perhaps before that patriarch. Most likely it was written by Job himself, and it is the most ancient book in existence. The instructions to be learned from the patience of Job, and from his trials, are as useful now, and as much needed as ever. We live under the same Providence, we have the same chastening Father, and there is the same need for correction unto righteousness. The fortitude and patience of Job, though not small, gave way in his severe troubles; but his faith was fixed upon the coming of his Redeemer, and this gave him stedfastness and constancy, though every other dependence, particularly the pride and boast of a self-righteous spirit, was tried and consumed. 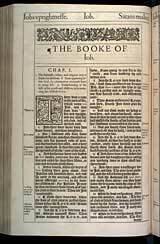 Another great doctrine of the faith, particularly set forth in the book of Job, is that of Providence. It is plain, from this history, that the Lord watched over his servant Job with the affection of a wise and loving father.The piety and prosperity of Job. (1-5) Satan obtains leave to try Job. (6-12) The loss of Job's property, and the death of his children. (13-19) Job's patience and piety. (20-22)1-5 Job was prosperous, and yet pious. Though it is hard and rare, it is not impossible for a rich man to enter into the kingdom of heaven. By God's grace the temptations of worldly wealth may be overcome. The account of Job's piety and prosperity comes before the history of his great afflictions, showing that neither will secure from troubles. While Job beheld the harmony and comforts of his sons with satisfaction, his knowledge of the human heart made him fearful for them. He sent and sanctified them, reminding them to examine themselves, to confess their sins, to seek forgiveness; and as one who hoped for acceptance with God through the promised Saviour, he offered a burnt-offering for each. We perceive his care for their souls, his knowledge of the sinful state of man, his entire dependence on God's mercy in the way he had appointed. 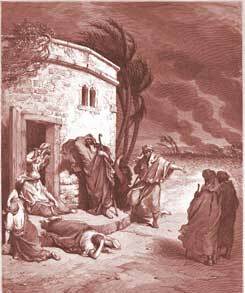 6-12 Job's afflictions began from the malice of Satan, by the Lord's permission, for wise and holy purposes. There is an evil spirit, the enemy of God, and of all righteousness, who is continually seeking to distress, to lead astray, and, if possible, to destroy those who love God. How far his influence may extend, we cannot say; but probably much unsteadiness and unhappiness in Christians may be ascribed to him. While we are on this earth we are within his reach. Hence it concerns us to be sober and vigilant, #1Pe 5:8|. See how Satan censures Job. This is the common way of slanderers, to suggest that which they have no reason to think is true. But as there is nothing we should dread more than really being hypocrites, so there is nothing we need dread less than being called and counted so without cause. It is not wrong to look at the eternal recompence in our obedience; but it is wrong to aim at worldly advantages in our religion. God's people are taken under his special protection; they, and all that belong to them. The blessing of the Lord makes rich; Satan himself owns it. God suffered Job to be tried, as he suffered Peter to be sifted. It is our comfort that God has the devil in a chain, #Re 20:1|. He has no power to lead men to sin, but what they give him themselves; nor any power to afflict men, but what is given him from above. All this is here described to us after the manner of men. The Scripture speaks thus to teach us that God directs the affairs of the world. 13-19 Satan brought Job's troubles upon him on the day that his children began their course of feasting. The troubles all came upon Job at once; while one messenger of evil tidings was speaking, another followed. His dearest and most valuable possessions were his ten children; news is brought him that they are killed. They were taken away when he had most need of them to comfort him under other losses. In God only have we a help present at all times. 20-22 Job humbled himself under the hand of God. He reasons from the common state of human life, which he describes. We brought nothing of this world's goods into the world, but have them from others; and it is certain we can carry nothing out, but must leave them to others. Job, under all his losses, is but reduced to his first state. He is but where he must have been at last, and is only unclothed, or unloaded rather, a little sooner than he expected. If we put off our clothes before we go to bed, it is some inconvenience, but it may be the better borne when it is near bed-time. The same who gave hath taken away. See how Job looks above instruments, and keeps his eye upon the First Cause. Afflictions must not divert us from, but quicken us to religion. If in all our troubles we look to the Lord, he will support us. The Lord is righteous. All we have is from his gift; we have forfeited it by sin, and ought not to complain if he takes any part from us. Discontent and impatience charge God with folly. Against these Job carefully watched; and so must we, acknowledging that as God has done right, but we have done wickedly, so God has done wisely, but we have done very foolishly. And may the malice and power of Satan render that Saviour more precious to our souls, who came to destroy the works of the devil; who, for our salvation, suffered from that enemy far more than Job suffered, or we can think. he was, a truly man of GOD, who was believes in GOD almight. This has always disturbed me. What is the reason to make a man suffer so much, and kill so many? What does God gain from this, besides proving a point to Satan? I understand God gives Job more than what he had back, but I don't think it's worth the suffering. I would rather live in a nice house and be happy than live in a nicer house with PTSD and depression because everyone/thing I loved is gone. This is what a strong house looks like. Why did Job choose to marry this woman, he had a lot of integrity.